The Massachusetts Department of Transportation (MassDOT) has been working diligently to partner up with approximately 350 schools and more than 115 communities to educate our students about the dangers of walking and biking to school in an effort to make their walk or bike to school is a little bit safer. The program will be spending nearly $4.5 million for the Safe Routes initiatives this year. This program is expected to reach at least a quarter of all of the students and attempts to reduce the risks of child injury in Massachusetts. This is the second entry of a three part blog in which we’re focusing on the importance of safe traveling to and from school. In the last entry we discussed students and their trips to school on school buses. Throughout this blog entry we will be discussing safety matters regarding students who either walk or bike to school. Our Boston personal injury attorneys understand that car accidents are the leading cause of death for our young children. Approximately 20 percent of these fatalities are a result of pedestrian-car accidents. This number is so high because experts believe that many children are not properly educated about safe on-foot traveling and that young children are unable to safely negotiate traffic. For this reason, parents are urged to speak with their child who may be walking or riding their bike to school this year about safe traveling habits that can help keep them safe and accident-free on our roadways. In 2007, there were approximately 27,440 children that were treated in emergency rooms for pedestrian-related injuries. -Parents are urged to walk to school with students that are under the age of 10. -Children should always walk on a sidewalk if one is available. If there’s no sidewalk, children should walk away from the road, but facing oncoming traffic. -Remind your child to always cross the street at an intersection or at a street corner. -Warn children to look both ways for oncoming cars before stepping off the curb to cross the street. -Keep looking left and right as you’re crossing the road. -Don’t run across the street. Always walk. Running makes you more likely to trip and fall in the middle of the street. -Make sure a child never darts out in front of a parked car because if there’s a motorists coming on the other side of the vehicle, they may not have time to react or stop. -Make sure your child always wears a helmet when they’re riding a bicycle. -Make sure that the helmet fits properly. To check the fit properly, make sure that the width of two fingers fits between the bottom of the helmet and your child’s eyebrows. -Make sure they understand the rules of the road. If they don’t you should ride to school with them until they do. -Make sure they know to ride on the right side of the road. If they’re riding with others then they should travel in a single-file line. -Always come to a complete stop before attempting to cross the street. -Wait until a driver signals that it’s okay to cross the street. -If you’re riding to or from school when it’s dark out, remember to wear bright colors. 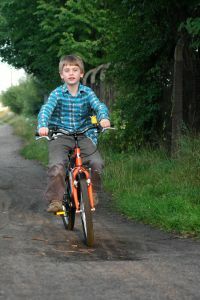 -Your child’s bike should always have reflective tape and lights on it so that they’re more visible to motorists. If you or your child has been involved in a pedestrian or a bicycle accident in the Boston area, contact Massachusetts Car Accident Attorney Jeffrey S. Glassman for a free and confidential appointment to discuss your rights. Call 1-877-617-5333.